Folk signs, which have not lost their relevance to this day, will help you to attract good luck to yourself, followed by happiness. The main thing is to learn to notice the prompts of the Higher Forces, drawing their attention to them, because through happy signs you are trying to point out the approaching success. Folk omens are different. Some of them warn of danger, others help to understand that your life will soon change for the better. We have prepared for you signs that do not belong to either the first or the second category — their purpose is to attract luck, happiness and prosperity. Good luck, as a rule, does not happen much — this postulate is true at all times, especially now, when success is especially important. Bringing good luck to yourself has always been considered relevant, and proof of this are national signs that have been tested not by one generation. The signs that have reached us from the past, attracting happiness, are a guarantee that luck will surely find you. The main thing — to notice them and allow the fortune to break into your life. It is important to notice the signs of fate that she is trying to convey to you, because so often people pass by their happiness, unaware that it was at arm’s length. We offer to your attention a list of signs that will make you happier and draw what is rightfully yours. A person who meets you with a full bucket of water foreshadows great success in the material sphere of life. Met with a redhead woman — expect happiness. A pigeon that sits next to you, on the visor of a window or tree branch, indicates that you will soon receive a large profit or reward. If the bird has sat on your window, you need to make a wish before it flies away. Saw the nest of rooks — soon you will see how your house is filled with happiness. Heard the cuckoo’s voice near his house or dacha — it means that luck is in a hurry to you. 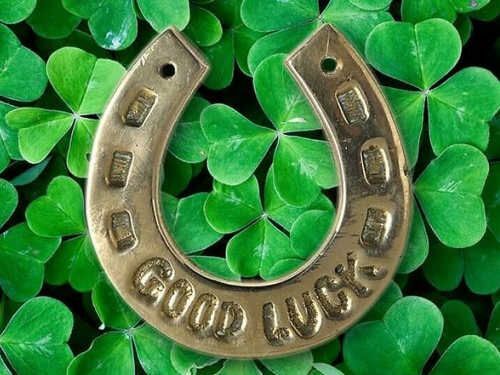 A popular sign that is used to attract luck to a new home. You need to walk through all the rooms, tearing off the flesh from a piece of black bread and throwing it in the corners. Wait until the bread dries, do not throw it away, but take it to be devoured by the birds. Your kindness, which the bread soaks up, will cover the whole world and return to you, multiplied several times. The web that the spider has laid above your bed indicates a huge profit or happy event that will drastically change life. The incidentally seen light in the windows of his apartment foreshadows unexpected happiness and success in business. If ants appeared near the house, expect stunning success in society. If you find a horseshoe on the street, it means that luck will always be on your side. But you cannot pick up such a find, you can bring trouble. It is forbidden to whistle in the house — it scares good luck, and with it the money. Transfer money that you lend into your hands only in the morning, noon and evening. Those who transfer money at night and over the threshold, luck leaves for a long time. Meet on the road with a cripple — gain health and good luck for a long period of time. Happiness promises an eagle or a plane seen high in the sky. If you accidentally crashed into a man — this is money, if a woman — wait for trouble. To catch the clatter of hooves — get happy news from afar. Accidentally pour tea — get cash luck. If you notice a running tricolor cat — it means that life will be very happy. There is another very interesting belief connected with the spring: if on a muddy road, the right foot fell into a mud or puddle earlier than the first, then expect a large reward in the near future. The flying beetle, which you noticed, indicates an approaching success. Our ancestors believed that the dishes always beats for happiness and success. If a bird flies into the room abruptly during a church service, it will bode well to everyone present in the very near future. If you want your luck to remain your constant companion throughout the year, drink the most recent one on New Year’s Eve, and your wish will come true. To start the day well, get out of bed with your right foot. Redundant silver brings new owners great luck and material success. There is a very ancient belief about how to attract favorable events. To do this, you need to pet a black cat or a black chicken. Is the phone screen broken? Do not be sad: this pretty new omen promises you a speedy happiness. If you see a priest or three nuns on the street, it means that the cherished dream will come true soon. Sneezing before you start eating, will soon get an unexpectedly successful development of events. If at the exit from the door the baby caught your attention first, then the whole day would pass successfully. So that luck does not turn away from you, you should wear clothes with your right hand. If you hear a ring in the right ear, expect good news, and vice versa, if you hear a ring in the left, bad news spreads about you. In order for happiness and good luck to live in your life, give the first pancake that was baked on Shrovetide to your pet. If you have a numb right leg along the way, the day will be successful and joyful. In order not to frighten luck out of your home, you should not look out the window until the sun rises. Face-to-face with a pregnant woman or a woman with a baby — pull a string of successful incidents to you for the whole week. If a loved one smiled at you in a dream, life will be filled with happiness. Going on a long journey, do a spring cleaning. The trip will go well, without negative consequences. Before leaving the house you should always sit on the walkway. This popular custom foreshadows good fortune outside the home. To meet on the street funeral procession, oddly enough, — to great luck. Soaked under heavy rain? Do not rush to grumble at the weather: this sign indicates good luck in all new endeavors. If a thorn has stuck to your clothes, get ready for luck.